For fighter info, see Richter (SSBU). Official artwork of Richter from Castlevania: Rondo of Blood. Richter Belmont (リヒター・ベルモンド, Richter Belmondo) is a protagonist in the Castlevania series. Like his ancestor Simon Belmont, Richter is a renowned vampire hunter, to the point of being the strongest member of the Belmont clan until being succeeded by his own descendant, Julius Belmont. 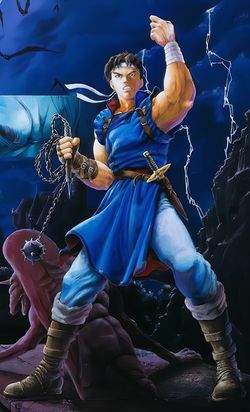 Since debuting as the main protagonist of Castlevania: Rondo of Blood, Richter has gone on to become an unlockable playable character in later Castlevania games. Official artwork of Richter for the European and Japanese release of Castlevania: Dracula X. In Castlevania: Rondo of Blood, Richter's story begins as he is training and studying a map of Dracula's Castle, before seeing smoke rising in the direction of Aljiba, the hometown of his fiancée Annette Renard. Rushing there on horseback and briefly encountering Death, Richter finds Aljiba in flames and Annette kidnapped by the newly resurrected Dracula and his army of monsters. Entering the castle halls and avoiding a grotesque monster known as the Behemoth, Richter rescues Annette's younger sister, Maria, and the two team up to stop Dracula and save Annette. En route, they rescue Iris, the daughter of a doctor; and Tera, the village nun. Richter then makes his way to the Castle Keep for a final showdown against Dracula, with both combatants offering differing views on humanity. With Dracula defeated, the castle begins to collapse, as Richter, Maria, Annette, and the other women watch as the sun rises over the rubble. Five years later, Richter is brainwashed by the dark priest Shaft not long after he entered the newly resurrected castle to investigate. Maria entered the castle herself to investigate his disappearance, which in turn forces Alucard to awaken from his centuries-long slumber, due to the unexpected lack of a Belmont to handle what is going on. These events lead to Castlevania: Symphony of the Night, which culminates with the brainwashed Richter doing battle with Alucard in the Castle Keep. Alucard is able to see Shaft's enchantments controlling Richter before he ultimately saves Richter. In Castlevania: Nocturne of Recollection, a year has passed since Richter was saved by Alucard. Soon after alerting Maria of vampire attacks in the village that she and Alucard resided in, Richter proceeds to investigate said attacks. After a brief interaction with fellow vampire hunters Cyril and Alexis, Richter quickly takes Maria back to her and Alucard's home upon her inadvertent affliction from Cyril's potion. Later, after another brief encounter with Cyril, Richter allies with him in order to save Alexis. Richter and Cyril proceed to meet with Alucard and, during their discussion, they are met by an injured Alexis, who is being trailed by Lyudmil, Alucard's former servant who is the vampire responsible for the attacks on the village. Richter allies with Alucard to stop Lyudmil and Magnus, an incubus who served under Dracula and now seeks to make Alucard the new lord of his father's castle by emotionally breaking him via manipulating Lyudmil and shattering Maria's trust in him. Upon subduing Lyudmil with assistance from a now-healthy Maria, Richter and Maria assist Alucard in his battle against Magnus. Thanks to Richter drastically weakening the incubus by destroying his claws and Maria helping Alucard overcome Magnus' mental torture, Alucard is able to kill Magnus, preserve his humanity, and bid farewell to a dying Lyudmil, who was freed from Magnus' enchantments shortly before passing. Because of the prophecy originally stated by Nostradamus about the end of the world and the return of Dracula in 1999, Richter bequeathed the Vampire Killer to other descendants of the Belmont clan, including Reinhardt Schneider and the Morris clan. The Morris clan was given official guardianship over the Vampire Killer sometime before 1897, holding onto it until the time came for the Belmont clan to reclaim it. However, a caveat came with those who were not a direct descendant of the Belmonts: the Vampire Killer would slowly drain the life away from its wielder, a fact discovered by John Morris and his friend Eric Lecarde in the aftermath of their encounter with Dracula; John was wounded during the battle against the Count and his niece, Elizabeth Bartley, yet his wounds were not healing. John died sometime after his son, Jonathan, inherited the whip, never telling him of its secrets and how to unlock its true strength, with the wounds ultimately claiming his life. In Castlevania: Portrait of Ruin, Jonathan and his childhood friend Charlotte Aulin can undertake the test of unlocking the Vampire Killer's full power during their mission to destroy Dracula. Due to Richter being the last full-blooded Belmont to wield the Vampire Killer, the whip's power manifests as a memory of him wielding a fully powered version of itself, several of Richter's sub-weapons, and his Grand Cross Item Crash. Upon defeating the Whip's Memory, Jonathan is given a few words of encouragement from Richter's spirit: "I'm counting on you..."
Richter, as he appears in Super Smash Bros. Ultimate. Richter appears as an Echo Fighter of his ancestor Simon in Super Smash Bros. Ultimate. However, it is noted that Simon himself takes inspiration from Richter to a greater extent as well, making them derivatives of each other. As a result, Richter is almost identical to Simon in regard to functionality. However, there is one notable mechanical difference between them: Richter's Holy Water possesses the Aura effect, whereas Simon's possesses a flame effect. Aesthetically, Richter has his own taunts and victory poses in reference to Rondo of Blood and Symphony of the Night, while his Holy Water's flame is blue compared to Simon's red. Although Richter's design is based on his appearance in Rondo of Blood, he also has aspects derived from various artwork designs. These include slightly shaggier hair (Harmony of Despair), as well as his tunic having white trim (Dracula X), white buttons (The Dracula X Chronicles) and a white interior (Symphony of the Night/The Dracula X Chronicles). Richter and Joker are the only playable third-party characters to have never appeared in a fighting game outside of the Super Smash Bros. series. Although Richter was going to appear in Konami's 1998 fighting game Battle Tryst alongside Simon, they were both were cut from the final game. Richter and Roy are the only clones to debut in the same game as their base characters. Richter is also the first third party character to be a clone. 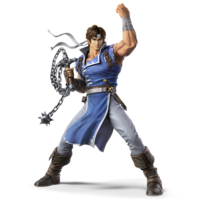 Richter is the fifth character to originate from a real world location, succeeding Snake, Little Mac, Ryu, and Simon, and preceding Ken and Joker. Although Richter's name is the same between English and Japanese, the announcer pronounces it differently between regions. The English version pronounces it as /ˈrɪk-tər-/ ("rick-ter"), while the Japanese version pronounces it /ˈriː-tɑː/ ("ree-tah"). This page was last edited on April 9, 2019, at 23:31.